Site owner (Super admin) or admin can add picks from backend. It is the same form as on frontend, but on backend you have many other options which are important for site owners. On backend you can edit/delete actual picks. 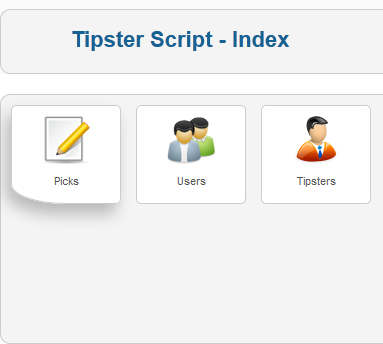 You can add new tipsters or change style. Click on new and you can insert your first pick. Over 10 years of experiences in betting. Worked as tipster adviser for many sites and has a knowledge how betting market works. Over 5 years of experiences with php and mysql. Many extensions for Joomla and other cms.